Thought I’d share some info on my current Amiga 1200 project. You see, I sold the AmigaOS 4.x computer on AmiBay not long ago. “Why?”, I can hear you ask. Well, honestly, the computer didn’t see much use after it was all set up and ready to go. I spent a bit of time configuring it and trying out some software, but sadly it didn’t do it for me. The machine ended up gathering dust in the cupboard due to lack of space. 😦 I must say that the OS looks great though and it is VERY fast and responsive, but I guess that was not enough to keep my interest. Due to this I’m back on classic again and currently adding some bits and bobs to my trusty old ESCOM Amiga 1200 computer. It is a nice setup and works fine for most stuff, but like a lot of other Amigans I’m on the lookout for some additional goodies in the hardware department.. My Amiga is currently powered by the stock 68020 CPU clocked at 14.7 MHz, so I want something with a bit more punch. I’ve considered the 68060 turbo-cards, but they are horribly expensive at the moment – we’re talking prices ranging from like £350 and upwards. I can’t justify spending so much, so I’m considering a 68030 or a 68040 instead. 68030’s are cheaper and both fast and reliable and I have had a couple of those boards before, like the Blizzard 1230 IV. Still, I might want to invest a bit more and get a 68040. I know these have a bit of a bad reputation due to issues with overheating and lack of compatibility, but my personal experience with these are OK – a lot depends on the manufacturer of the board in my opinion. Anyway, if a good deal emerges, I might get my hands dirty with a 68040 – and that will be that. 🙂 Time will show. 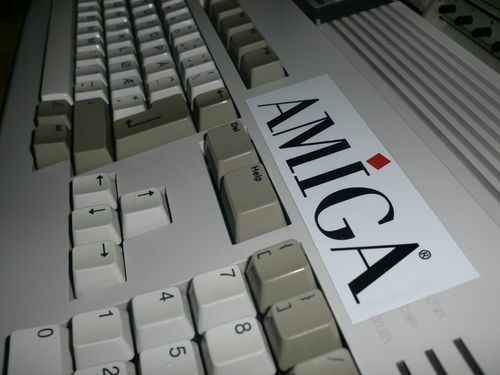 Now, anyone else out there currently working on Amiga or other retro computer/console project? If so, I’d love to hear from you. 🙂 Thanks in advance. Thanks for reading and have a good evening! I was about to start a project of purchasing a couple of old gaming consoles from the thrift store and turning them into retro game machines, but had to halt that idea since I started working on building up my project/home studio for my audio restoration business. I guess in a way with my current setup it is kind of retro in that I now have a record player (all speeds including 78) and a excellent working Pioneer cassette deck. I also purchased a sub-woofer for about $6, it isn’t one from a professional audio company but it does what I need it to. I might have to go over my setup on Ocular sometime. Good to see you’re still working on the Amiga projects. Yes, I agree, your setup is a bit retro. Love the fact you’ve got a cassette deck – it is incredible how well those old tapes are functioning even today. I’ve got quite a few and they still play well. My old car, a Chrysler Stratus, had a deck and a CD-player in the trunk (hehe). Needless to say, I mostly played tapes in it. Many thanks! 🙂 Hope you can get your project going in the near future.